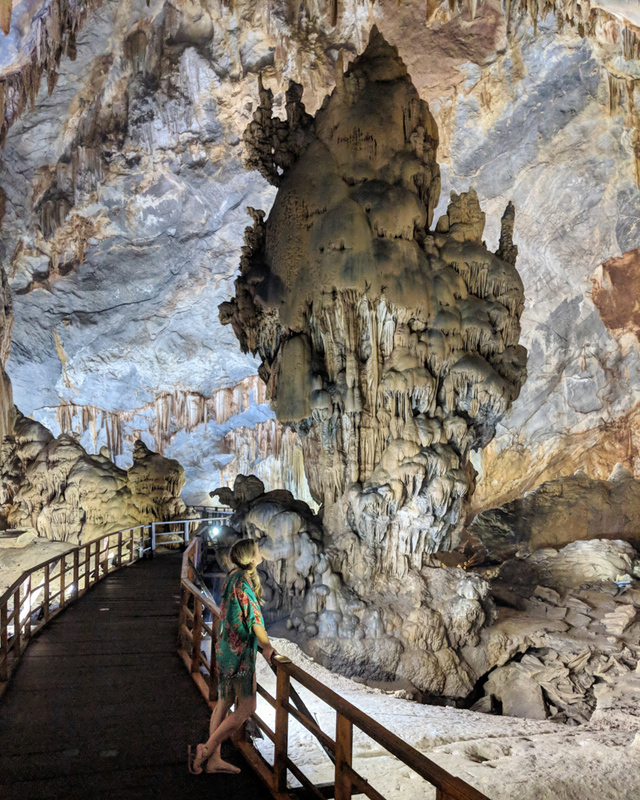 Phong Nha-Ke Bang National Park was designated a UNESCO World Heritage Site in 2003 as it is home to the oldest karst mountains in Asia as well as literally hundreds of cave systems. This complex underground cave system also includes the largest cave in the world by volume – Hang Son Doong. You’ll have to drop a pretty penny to explore it, but there are plenty of others in the area to keep you happily spelunking. Phong Nha Cave, Paradise Cave, and Black Cave are the most popular and easily accessible caves in the area. You can visit all 3 on your own – no need to hire a tour guide. Because most of the caves close around 4:30pm every day, you’ll want to spend a few days in this quaint town so that you can explore all of the highlights. 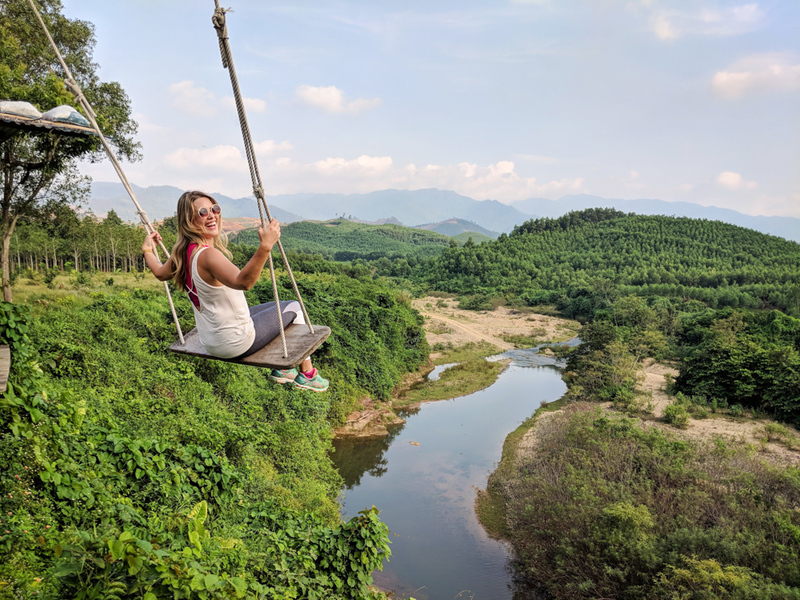 Read on to learn all about what to eat, where to stay, and what to do during your trip to Phong Nha! The currency in Vietnam is the Dong (VND). At the time of writing (September of 2018), the conversation rate was about 23,404 VND to $1 USD. So if we say that something costs 50,000 VND, that’s just about $2 USD. There are several ATMs around Phong Nha so no need to bring excess cash unless you really want to. Drinking the tap water in Phong Nha is not advised. It contains high amounts of limestone, calcium, and other minerals. The town of Phong Nha is the closest area to the caves that offers accommodation and dining options. If you take the train that runs the length of Vietnam, you’ll need to get off in Dong Hoi and hire a car to take you the remaining 30 or so miles to town (expect to pay between 350,000 – 500,000 VND). Tourist buses also run to and from Phong Nha directly. You can easily book both train and bus tickets through any tourist agency in town. The town of Phong Nha is very small and concentrated. The Tourist Center, where you’ll catch the boat to the Phong Nha cave, is right in the center of town. But if you plan on exploring more of the Phong Nha-Ke Bang National Park you’ll want to rent a motorbike to get around. Plan on spending about 100,000 VND/day for a bike and a helmet. 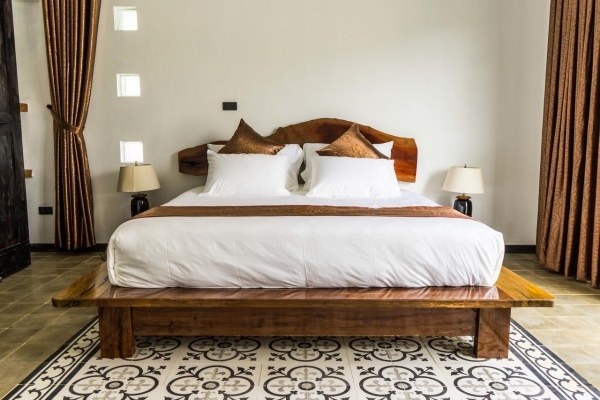 Victory Road Villas are the ultimate in luxury in the middle of Phong Nga town. 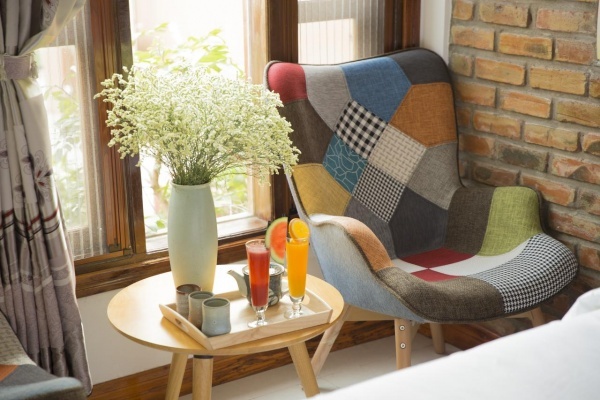 Rooms are huge and tastefully decorated and everyone on staff is so friendly and helpful. You’ll love the gorgeous pool, the stunning views, and it is centrally located near several bars and restaurants in the center of town. 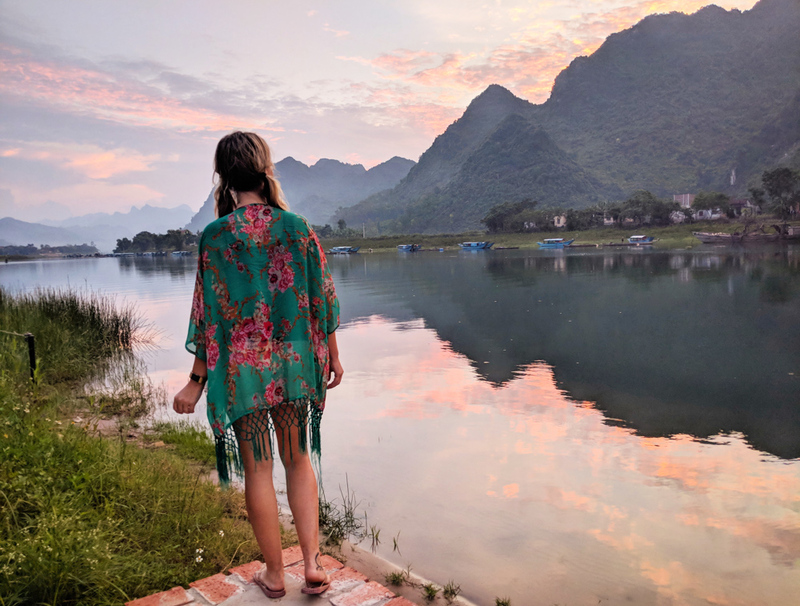 If you’re looking for a more tranquil setting, outside of town, then Phong Nha Lake House Resort is just perfect! The villas are located right on the lake and you’ll love having kayaks available for your use. Rooms are comfortable with darling decor and the beautiful pool is the perfect place to spend a lazy afternoon. If you feel like you’ve been eating copious amounts of meat during your trip to Vietnam, you’ll love all of the yummy vegetarian options at Phong Nha Bamboo Cafe! Omar’s Namaste is the perfect choice if you’re looking for a break from the classic Vietnamese dishes. If you love Indian food, you can’t go wrong here. D-Arts Zone has a limited menu but you should stick to the bun cha anyway, it’s their specialty and it’s amazing. Bomb Crater Bar is a quaint, relaxing bar that is sandwiched between the lake and a massive bomb crater. It’s a nice place to have a swim and enjoy one of their signature gin and tonics! 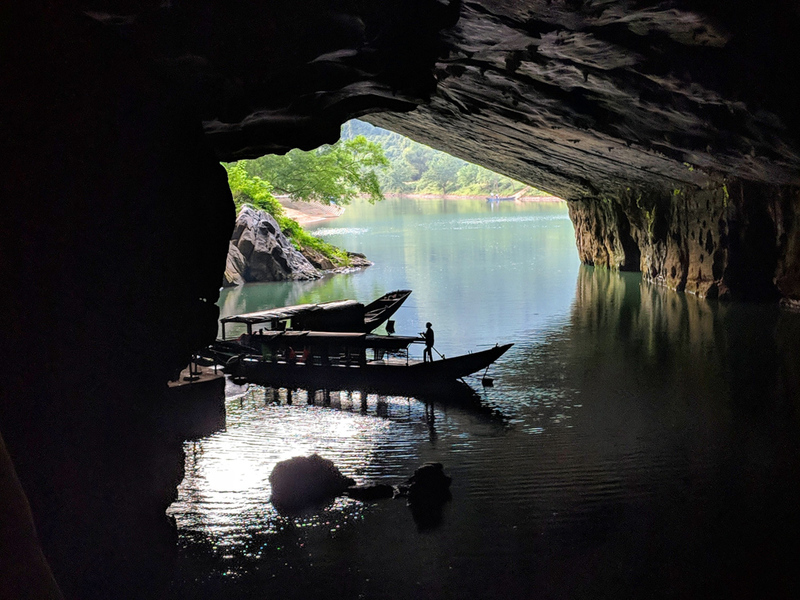 Phong Nha is the longest river cave in the world and is only accessible by boat. It was first discovered in 1899 and was used during the American War (Americans know it as the Vietnam War) as a hospital. The cave is incredibly impressive, the stalactites and stalagmites even resemble an ancient gothic cathedral in some areas. There are three different sections in the cave, all are a bit different, and all stunningly beautiful! Your tour of the cave will last for about 2 hours. You’ll start with a boat ride to the end of the cave and then on the way back out you’ll stop and get out. Then you can explore a portion of the boat by foot. The entire cave is well lit so it is ideal for snapping a few photos. 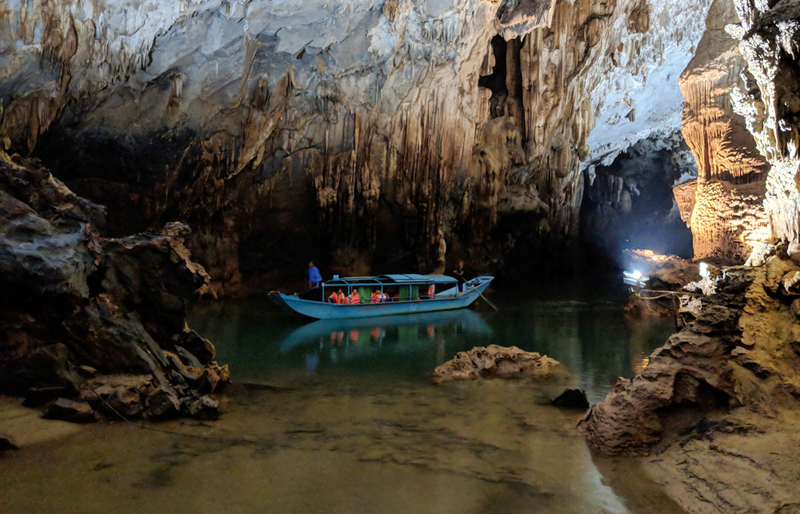 Phong Nha cave appears on Google Maps and if you’re like us, you probably think you should ride a motorbike to the entrance. While the drive is quite pleasant, you can’t actually get into the cave here. 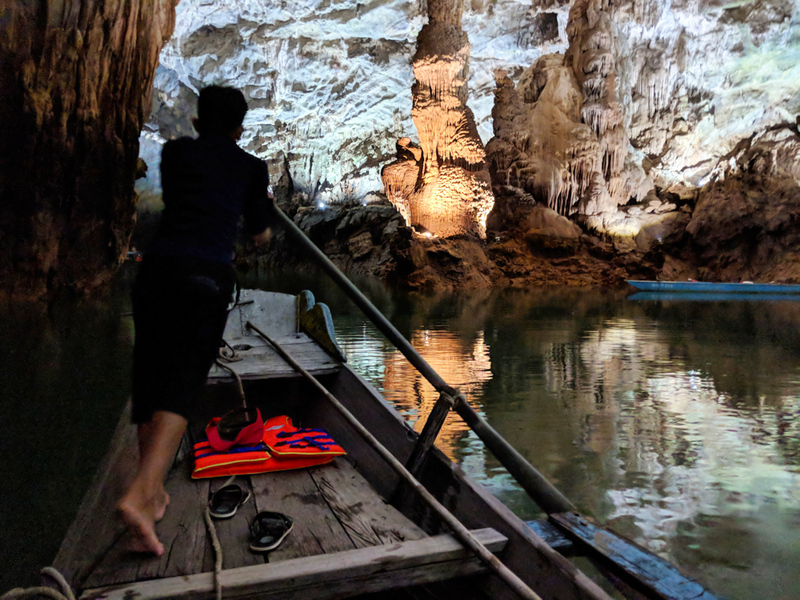 You’ll need to buy your boat tour ticket from the tourist center in Phong Nha town and then board a boat that will take you the entire way to the cave. Your boat can fit up to 12 people and is the same price whether there are 2 of you, or 12. So best to make some friends near the ticket booth prior to paying. 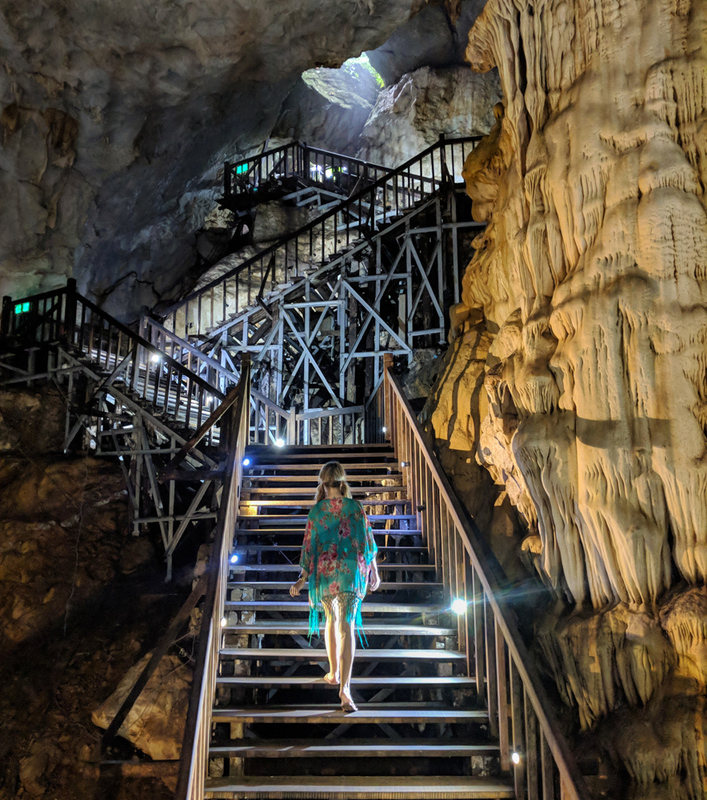 Paradise Cave is a massive, spectacular cave that is a must-visit while in Phone Nha! A wooden bridge spans the 1/2 mile or so distance from the cave opening to the end and lights illuminate the unique stalactites and stalagmites. The formations get more and more epic as you continue along the walkway. Be sure to take your time, stop at the lookouts, and check out how incredibly high the cave ceiling is in some places. The sheer size of this cave is really unbelievable! Don’t underestimate the amount of walking that you’ll need to do while visiting Paradise Cave. If you drive a motorbike, it’s about a third of a mile just to get to the ticket booth. From there you can walk the mile or so to the cave or take a buggy for a small extra charge. Then it’s a short but steep walk up to the entrance of the cave. And once inside, it’s about a half of a mile to the end of the out-and-back. Many reviews complain that the cave gets packed with tour groups. We arrived to the cave at around 3:30pm on a Sunday and had the entire cave pretty much to ourselves. Plan on going early or late if you want to avoid the crowds. Dark cave is not only really really dark (due to the lack of artificial lighting) but also far more adventurous than the other two caves. The 3.75 mile-long cave was discovered in 1990 and has gained popularity with backpackers craving an adrenaline rush. Your tour will start with a zipline ride to the entrance of the cave. At 1,312 feet, it is the longest zipline in Vietnam. Then you’ll have a short swim into the cave where you’ll start your trekking tour. You’ll be provided with a headlamp to illuminate the path as the cave is pitch black. As you get further and further into Dark Cave, the trail gets muddier and the passageway gets narrower. You’ll be slipping, sliding, and struggling until you reach the big mud pit at the end. Here you’ll be able to splash around and have some laughs until you’re completely covered from head to toe in thick, brown, cave mud. It’s great fun but anyone who is claustrophobic or wearing white should beware. Several entrepreneurial locals have started unique businesses off a bumpy dirt road about 15 minutes outside of town. 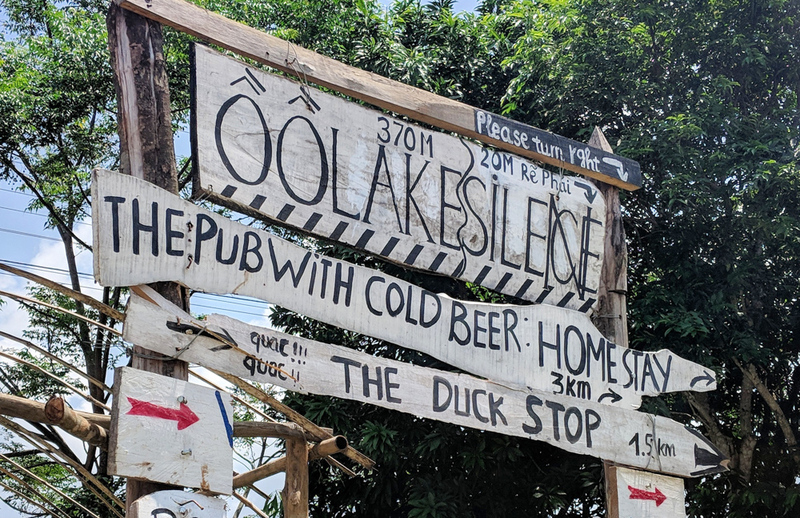 After taking a right off of QL16 to follow the signs, the first place you’ll come to is called The Duck Stop. Here you’ll start with an ice cold beer or soda and enter a sort of queue. 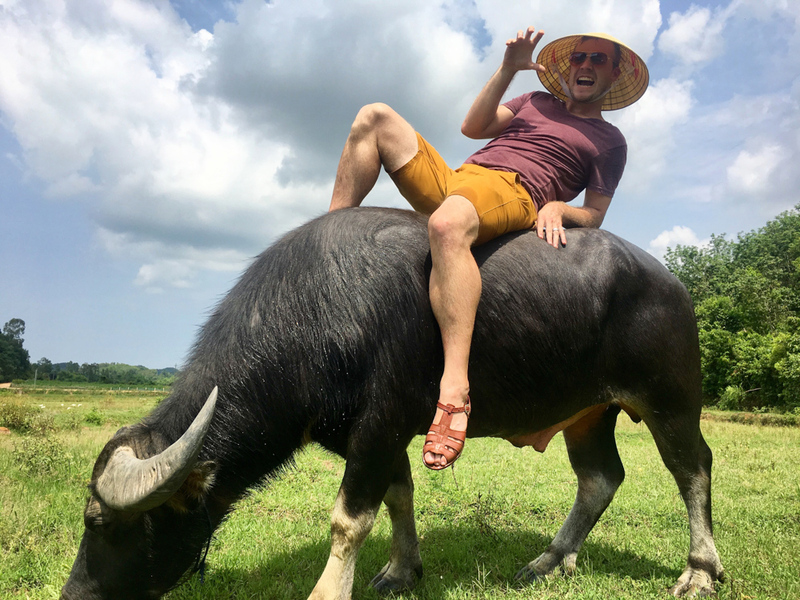 You’ll be given a conical hat and plastic sandals and choose your adventure – just feeding the ducks or feeding them and then taking a ride on Donald Trump (their friendly but not-so-aptly-named water buffalo). And it’s not like any old duck-feeding experience. The 20-year-old who started the operation, Quinn (also known as “Quack Quack Man”), is hilariously entertaining. First the ducks will eat out of your hands, then you’ll do a strange little dance while they follow you around, and then they’ll eat off of your feet which tickles terribly! If you choose to ride Donald Trump he’ll start by wading through a brown, murky pond and then head over to the field for a bite while you have a quick photoshoot. Quack Quack Man claims that the water buffalo had a really hard life before beginning his job at the Duck Stop and now he is quite happy. The rides are all short and he gets to spend most of the day lounging and eating. 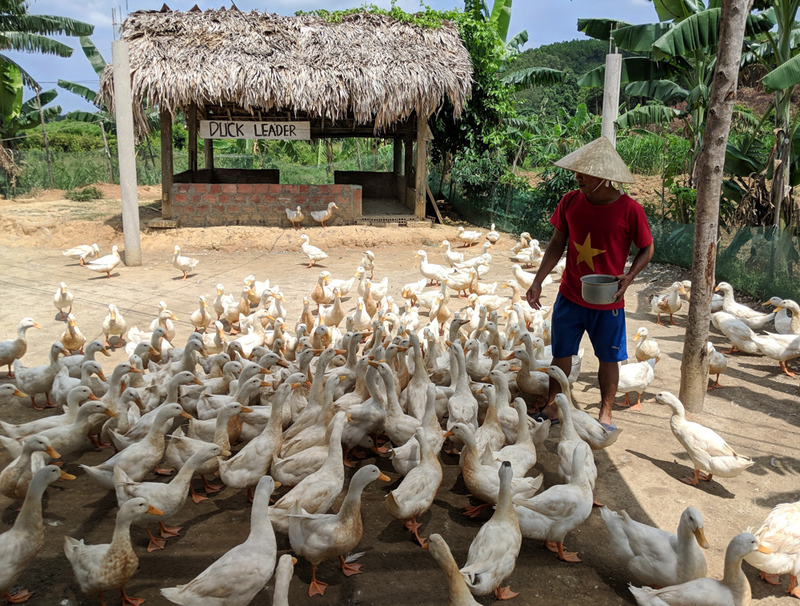 Note: All of the animals appeared to be very loved, well fed, and well cared for at the Duck Stop. Drive a bit further down the road and you’ll come upon The Pub With Cold Beer. Not only is it a chill spot with hammocks, swings, and a water slide, but they also offer the ultimate farm-to-table meal. You can actually catch and kill your own chicken. If you are a lover of chickens then this probably isn’t for you. But if you appreciate knowing exactly where your lunch came from and seeing it being expertly prepared, you’ll probably find it fascinating. To begin your “catch and kill” mission, you’ll be given a big net and let loose inside the chicken enclosure. 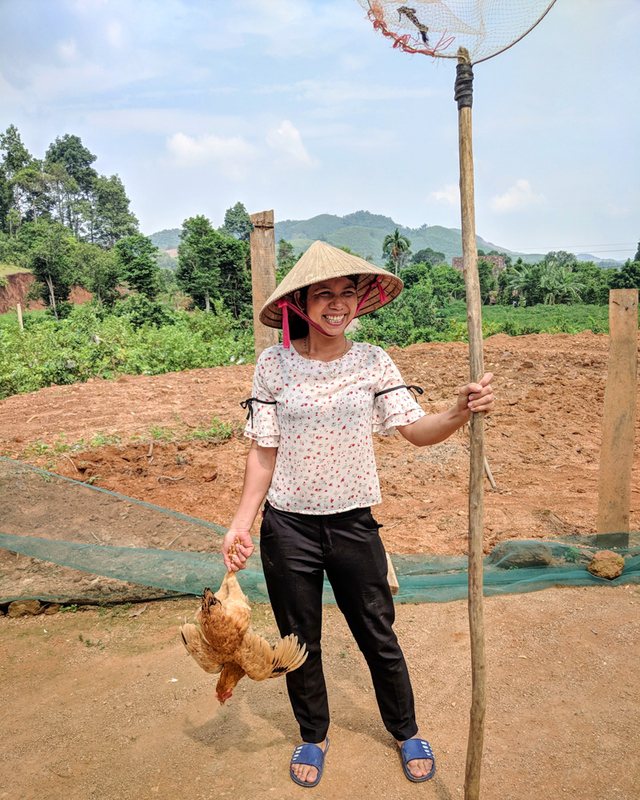 The meat is priced at 200,000 VND per kilo and most of the chickens are somewhere between 1 and 1.5 kilos. But you probably won’t be worried about the size, you’ll be lucky if you can even get close enough to trap one inside of your net. Of course the owner is there to help if you need (I did!). 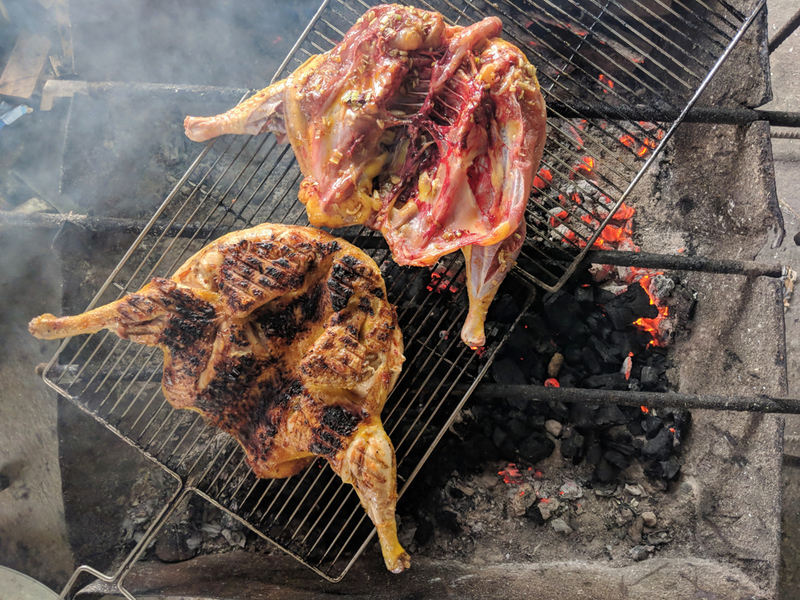 Once you’ve caught a chicken you will break its neck and then watch as it is defeathered, cleaned, filleted, and then cooked over an open flame. You can add vegetables, rice, and peanut sauce to your chicken for an additional 50,000 VND. The chicken is tasty but the experience is much more memorable. Continue even further down the road and you’ll come to Bong Lai Rattan House. For only 100,000 VND/person they will rent you a river tube and drive you 2 kilometers up the road so that you can lazily float back down to where you started. You’ll enjoy the views of the valley surrounding you while keeping cool in the midday heat. Bong Lai Rattan House also has a relaxing vibe in their bar/restaurant so it’s worth hanging out for a bit after your soak. Wild Boar Eco Farm is the last stop along your drive down this bumpy, dirt road that is seemingly in the middle of nowhere. This spot is owned by an incredibly friendly gentleman who is happy to let you drink beers while soaking in the valley views below for as long as you want. He has constructed the most impressive swing of all of the bars in the area as it sits right on the edge of a cliff overlooking the valley. Don’t fall off! The Wild Boar Eco Farm also has a homestay if you are looking for an inexpensive spot to stay in the countryside. The Phong Nha Botanic Garden is a beautiful, tranquil area to explore during your stay in Phong Nha. It’s along your route to Paradise Cave and is an easy stop as it shouldn’t take more than 2 hours to see the highlights. After purchasing your entrance tickets you’ll cross 2 bamboo bridges and then hang a right to follow route one. It’s less than a mile to the picturesque Thac Gio Waterfall. 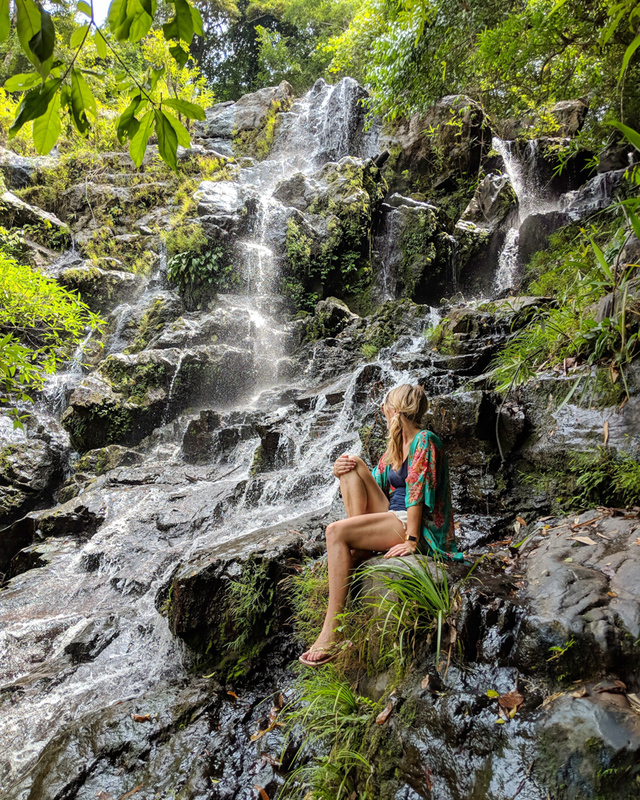 Stop at the waterfall for a few photos and a swim. Then follow the ropes up to the top of the waterfall to make the hike into a loop. There are other small swimming holes in the park but the highlight is Thac Gio. Most of the trails are flat but you’ll have to do some rock scrambling to get down to (and then back up from) the waterfall. So shoes with some traction would be recommended. There is a small restaurant and toilets near the entrance. The Nuoc Mooc Springs Eco Trail was built in 2011 and is popular with tourists looking to soak in the beautiful scenery of the national park. It’s a short, easy walk on a winding walkway and across several bamboo bridges to the confluence of two rivers. An underground river system flowing through the limestone mountains meets the Chay River and creates an ideal spot to spend an afternoon. Here you can swim in the pristine waters with limestone mountains towering above you. Visitors can enjoy crossing the rope bridge, kayaking on the river, or enjoying a traditional Vietnamese meal at the restaurant. Weekend afternoons get crowded so go early or later in the day if you’d like a more peaceful experience. 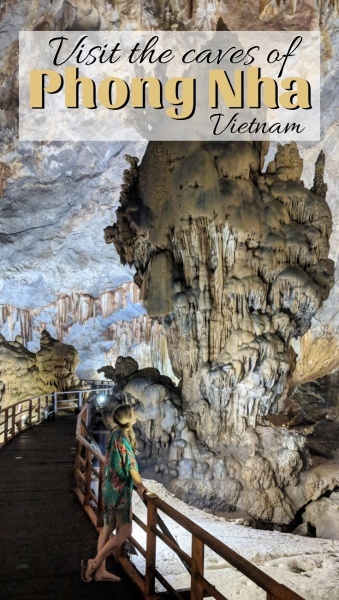 We hope this guide helped you to prepare for your trip to the beautiful region of Phong Nha! 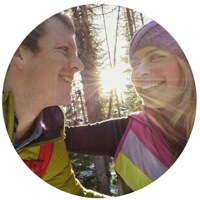 While we generally prefer to explore on our own, we understand that many people are short on time or simply enjoy joining a tour group. You’ll likely pay more but will have to do less planning and will meet some new friends along the way! Get Your Guide offers several options that you can book in advance. The Dark Cave seems like one crazy mind-bending journey!